iNK oN pAPER aCOUSTIC – is a drum, bass, and often electronics duo from Milton Villarrubia III (drums and laptop) and Carlos Santistevan (bass and electronics) who share 15 years of working together as a rhythm section in various projects. The Duo takes bass, drums and electronics to a new place. 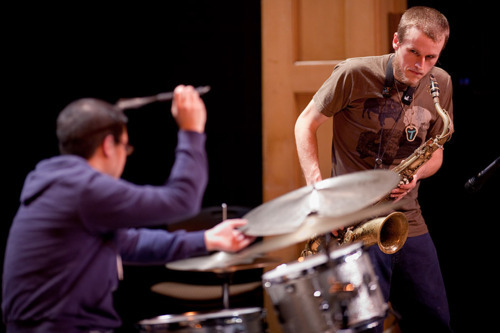 Both members often play hybridized versions of their instruments with Milton using Midi triggers on his drums to trigger and process samples using Ableton Live and Carlos using live looping and signal processing on his upright electric bass. The result is a duo that is drags rhythm through the mud in unimaginably glorious ways. Rhonda Taylor has been on faculty at New Mexico State University since 2003, where she is the College Assistant Professor of Saxophone and Music Theory. She completed her D.M.A. at the University of Arizona, where she studied with Kelland Thomas. She earned her M.M. as a graduate assistant of John Sampen at Bowling Green State University. Her additional studies include performances in master classes held by Fred Hemke and Eugene Rousseau, as well as attending Domaine Forget Music Academie to study with Jean-Marie Londeix and Jean-François Guay. 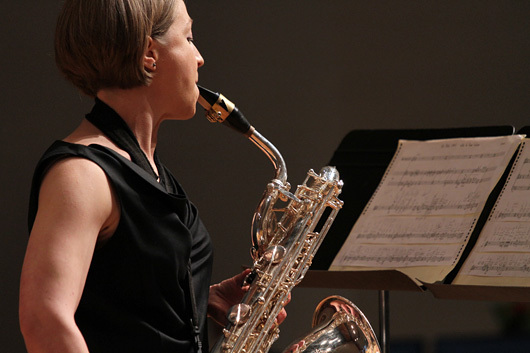 In 2002, she was awarded a scholarship to the International Clarinet and Saxophone Connection held at New England Conservatory, where she studied with Arno Bornkamp, Jean-Michel Goury, and Kenneth Radnofsky. Dr. Taylor is dedicated to the creation and performance of meaningful sonic art of our time. 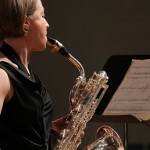 Her recent activities include presenting a recital of late 20th century solo saxophone works at Spivey Hall in Atlanta, lecture recitals on Gérard Grisey’s Anubis et Nout at the Manuel Castillo Conservatorio Superior de Música in Sevilla, Spain, and at the Université de Montréal, as well as performances at the Group for Liquid Media’s New Music for Saxophone(s) in Rochester (NY), North American Saxophone Alliance Biennials, World Saxophone Congresses, the ThreeTwo Festival of New Music (NYC), the Bowling Green State University 20th Annual Festival of New Music and Art, the University of Minnesota Duluth New Music Festival, and the University of California San Diego Spring New Music Festival. Her recording of Jeffrey Mumford’s the milliner’s fancy, a solo work she jointly commissioned with David Reminick, is available as part of the CD The Promise of The Far Horizon on the Albany label. Her live U.S. premiere of Ghosts, for solo baritone saxophone, written by Chris Arrell for her in 2006, is available on the Beauport Classical label. In 2009, she released a recording of new works by Rick Burkhardt, Audition. Her most recent release, Interstice, features new music by Ben Leeds Carson, Justin Rubin, Avi Tchamni, and Ben Grosser. 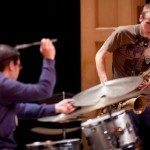 Upcoming projects include taking part in a group commission for a new work for baritone saxophone and electronics by Nathan Davis, and she is currently working closely with Guggenheim Award winning composer Steven Takasugi on a new work for solo saxophonist and electronics to be premiered in 2013. Rhonda Taylor is a Conn-Selmer artist and plays on Selmer Paris saxophones exclusively. compositions. 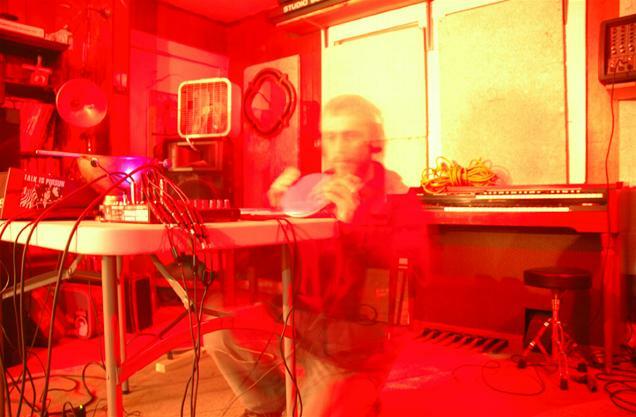 Known for low end dronescapes that rumble, pulse and shimmer in a particularly dark industrial atmosphere. contact mics to add color to his clouded sound world. 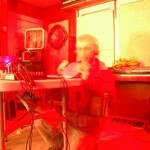 Debut of New solo Project by Damon Griffith of BullSeal!, Cloacas, and the Coleslaw King himself.